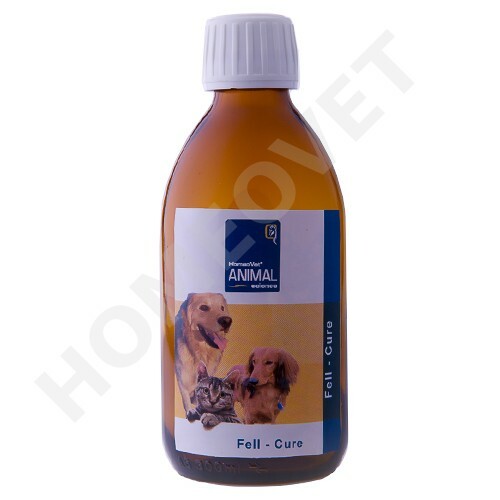 Homeovet Fell- Cure is a combination of cold-pressed natural oils that are not refined. Fell - Cure is used for dull coat, broken hair, dry hair, dandruff, bald spots and excessive hair loss. These phenomena are mainly caused by too little quality oils (eg. omega 3 fatty acids) in the diet of dogs. 100% vegetable oil, and linseed oil, safflower oil, sunflower oil, wheat germ oil and walnut oil. Vitamins A. D. E. F. as a complex, omega 3 fatty acids and lecithin. Small dogs, one teaspoon per day. Large and medium-sized dogs a tablespoon per day.